Stilettos & Grace: Today... six years ago. Something about looking at the photos from yesterday's post made me all nostalgic. So, I jumped back to the earliest digital picture we have on today's date. (It was on November 10th, 2004. And when I saw what it was I smiled pretty big. It was taken at 8:48pm, so we must have recently returned home from somewhere. Ian had a habit of shedding his clothes as soon as he walks in the door. He actually still does this. 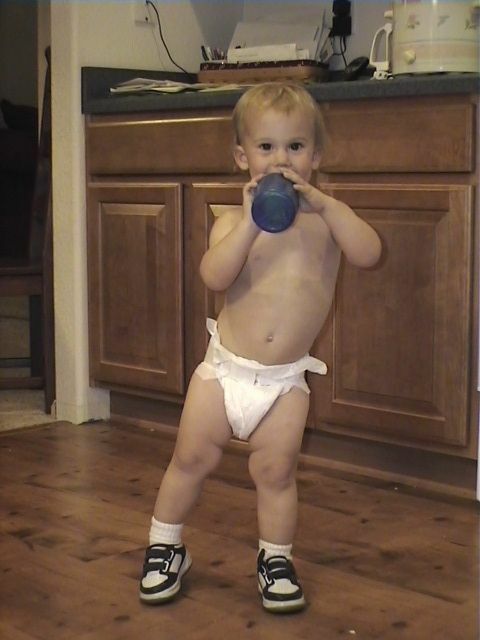 I think I'm remembering, though, that when he was this age his shoes were too much work for him to remove himself. I recently watched a friend's kiddos. They were sleeping most of the time, but their adorableness when their sleepy heads emerged into the living room? I sat on the couch while the youngest just leaned back on my lap and discussed things with me. and how he can open his own door now. Today a friend introduced me to her niece, and I got to hold her. And push my cheek against her squishy cheek. And she played with my big gold hoop earrings. And she smiled because I smiled. I'm in this stage of missing having babies. No, I don't miss the diapers or the sippy cups or the Cheerios everywhere. I don't miss having to carry around a diaper bag or having to get everyone's lunch or having to find a babysitter so we can have a real date night. But, I do miss having a smooshy bundle of chubbiness climb up in my lap... often clad in only a diaper... just because it wants to be with me. I'm so thankful I've been making sure to enjoy and relish every stage of life. Because when I'm looking back on and missing one, I know I didn't actually miss out when I was in that stage.